I don't think this has been widely noticed in government yet, but Australia achieved an interesting Gov 2.0 first this week on the back of the Myers disability scandal. The backstory: after the Prime Minister announced that DisabilityCare, the National Disability Insurance Scheme (NDIS), would be partially funded through an increase of 0.5% in the Medicare levy, the CEO of Myer, Bernie Brookes, was reported to have told a Macquarie Investment seminar that the levy was a bad idea as it was '' something they would have spent with us [Myer]''. This led to a social media protest using the hashtag #boycottmyer, a number of critical articles in newspapers and roughly a 6% drop in Myer's share price. These reactions led to a 'backdown' by Mr Brooks, who made a (non)apology ''to those who may have been offended or hurt'', but didn't back away from his comments. However what is really interesting from a government perspective was what happened next. An epetition was started on Change.org as a reaction to Mr Brook's comments. 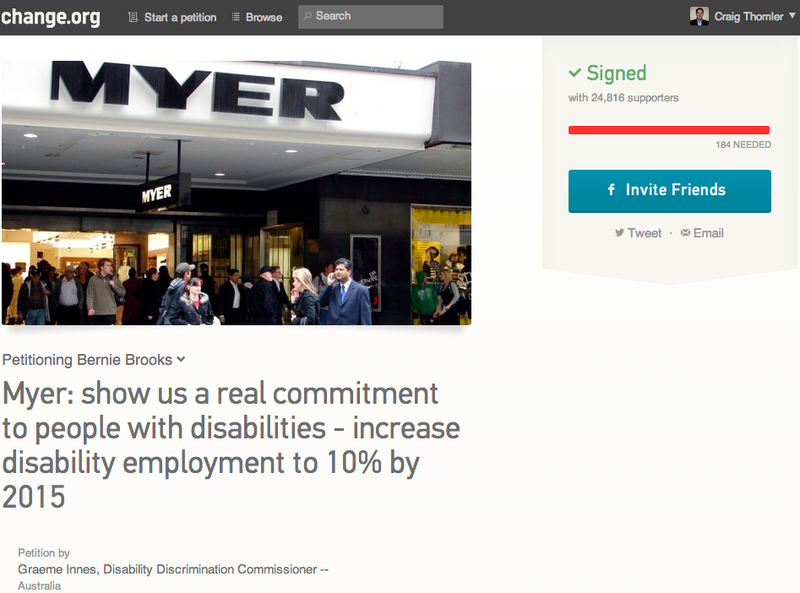 This epetition asked Mr Brook and Myer to make a "real commitment to people with disabilities", by increasing disability employment to 10% by 2015. Within 24 hours this epetition amassed over 24,000 signatures (including mine). It might be hard to see in the image besides this text, but below the epetition is the name of its creator, Graeme Innes. Graeme Innes happens to include his title as well 'Disability Discrimination Commissioner for Australia'. That's right, Mr Innes is the federally appointed Disability Discrimination Commissioner and has been since 2005, a senior public servant working in the Human Rights Commission, a statutory body solely funded by the Australian Government. So let's consider this again. The CEO of one of Australia's largest companies makes a comment at a fairly small event about his views regarding how disability care should and should not be funded. He learnt, as Mitt Romney did earlier this year, that due to technology and empowered citizens, there's now only one room, and everyone can be in it all the time, as his comments get reported in the media and on social media. The government's most senior official responsible for the disabilities area responds by officially creating an epetition on a leading online platform for fostering civic participation - an epetition specifically designed to attract and attracting a significant level of public engagement and support. Can anyone remember how this type of scenario would have played out before the internet or, more recently, before the rise of social media and digitally engaged citizens (as long ago as when Mr Innes took up his present role in 2005)? Firstly, the CEO's comments would likely not have been recorded and reported. Even if reported in the newspapers there would have been limited, if any, ability for the community to react to his words in a public manner other than letters to the editor the next day. If reported, the Disability Discrimination Commissioner would have (at most) released a media release calling the comments 'inappropriate'. Or, post-internet, issued the release and added it to the Commission's website, and that would have been the end of it. There would likely have been no public backlash, no public (un)apology by the CEO and the Disability Discrimination Commissioner would have not made an attempt to bring the weight of public opinion to bear. There simply wasn't a way for the Commissioner to do so - even for Mr Innes in 2005. So what we've seen this week isn't simply a minor spat fed by an out-of-touch and close to retirement CEO making comments that appear to place his company's profits ahead of a significant social issue. What we've seen is a senior public servant step out of the shadows to lead and shape community sentiment - engaging and leading the crowd through the use of an online social media platform specifically designed to foster social change. To my knowledge that has never happened before in Australia. When governments and their appointed or elected officers begin engaging and empowering the 'crowd' to aid social change we're witnessing a major change, even a paradigm shift, in how governments interact with and engage their citizens. Expect to see much more of this type of engagement as Government 2.0 and social media become business as usual across Australia, and around the world. In the immortal words of Bob Dylan, the times they are a'changin.